Looking for STICKY POLY SHEETING? Click this link to view our self adhesive poly sheeting roll options. Asbestos disposal bags are necessary for anyone who wishes to safely remove and properly dispose of asbestos from their home or business, while at the same time keeping exposure to asbestos to a minimum. 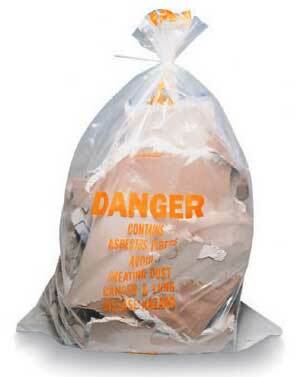 Proper asbestos disposal bags are required in order to meet OSHA safety standards when disposing of asbestos. 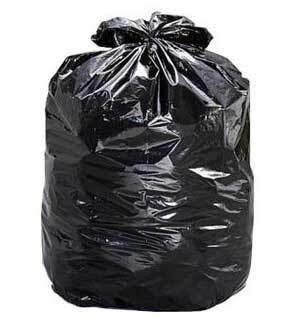 These asbestos disposal bags come in black and clear. They are available in 50 gallon or 60 gallon sizes. 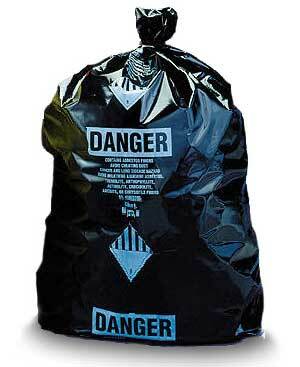 Asbestos disposal bags are made of industrial weight polyethylene and have an approved asbestos warning on them that says Danger/Contains Asbestos Fibers/Avoid Creating Dust/Cancer and Lung Disease Hazard. Some disposal bags come non printed but is not suggested. Regulations require that you put asbestos material into the asbestos disposal bags while it is still damp. The asbestos disposal bags should not have more than thirty to fifty pounds of material placed in them. You should check the rules for disposal of asbestos in your area to see what their regulations are for the weight of asbestos disposal bags. Many places require you to double bag your asbestos waste using the asbestos disposal bags and sealing each of the asbestos disposal bags with duct tape. Asbestos can never be disposed of in the regular trash, even if it is properly labeled. Disposal of asbestos is only allowed at certain locations, and there is a charge for disposing of asbestos, usually this depends on the weight of the asbestos you wish to dispose of. It must be properly contained in asbestos disposal bags and you must have the proper paperwork in order to dispose of your asbestos disposal bags. Some disposal locations are only open on certain days, so be sure to check this beforehand.